I’m off on my travels again soon so have been busy in the studio this week getting ready. Preparing and printing handouts, laminating new signs for the stand (I love laminating), deciding which quilts and fabrics to take to display and, the time consuming bit, mixing textile inks, cutting fabric and making up workshop kits. And figuring out what I need to take to demonstrate breakdown printing and screen printing. I really enjoy the occasional week like this - I started with a very long to-do list and have been diligently ticking them off turning what seemed like a mountain of work into a tidy and labelled set of boxes ready to load in the car. All this activity because in three weeks time I (and my partner in crime, son Joe) will be at the Scottish Quilting Show (part of the Creative Craft Show) at Glasgow SEC from Thursday 7th to Sunday 10th March. I will be demonstrating on stand ZM26 . I’m looking forward to the show especially because we’ll be staying with my daughter who lives in Glasgow. The following week I’ll be at the Fashion and Embroidery Show (alongside the Sewing for Pleasure Show) at Birmingham NEC. I’m there from Thursday 14th to Sunday 17th March on stand ZL40. I’ve booked an AirBnB for the duration - not as nice as staying with Jess but better than a hotel. I will also be doing a 90 minute workshop called Colourful Cityscapes each day at both shows. It’s my first time at these shows so if you are visiting please come by and say hello - it is lovely seeing friendly faces! In case you haven’t noticed I am most definitely not a last minute person! But getting ready three weeks early is early even for me. That’s because I have two groups of students in the studio between now and then. I also have some BIG stuff happening which I hope to share with you next week. And I’m taking 5 days off to go on my annual retreat with my buddies from the North West Contemporary Quilt Group. Yes I am taking 5 days off. I will be taking my sewing machine and expect to put in many hours quilting my next Ruins piece surrounded by good company and sustained by good cake and the odd glass of wine. Can’t wait! 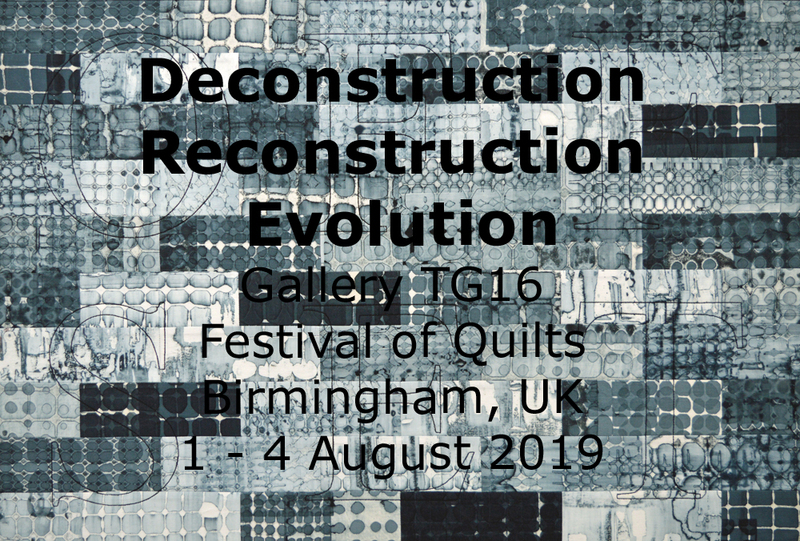 It is exactly 6 months until the opening of my solo exhibition, Deconstruction - Reconstruction - Evolution, at this years Festival of Quilts in Birmingham. I have a lot of work to do between now and then but at least I have finally decided on a name for the exhibition. 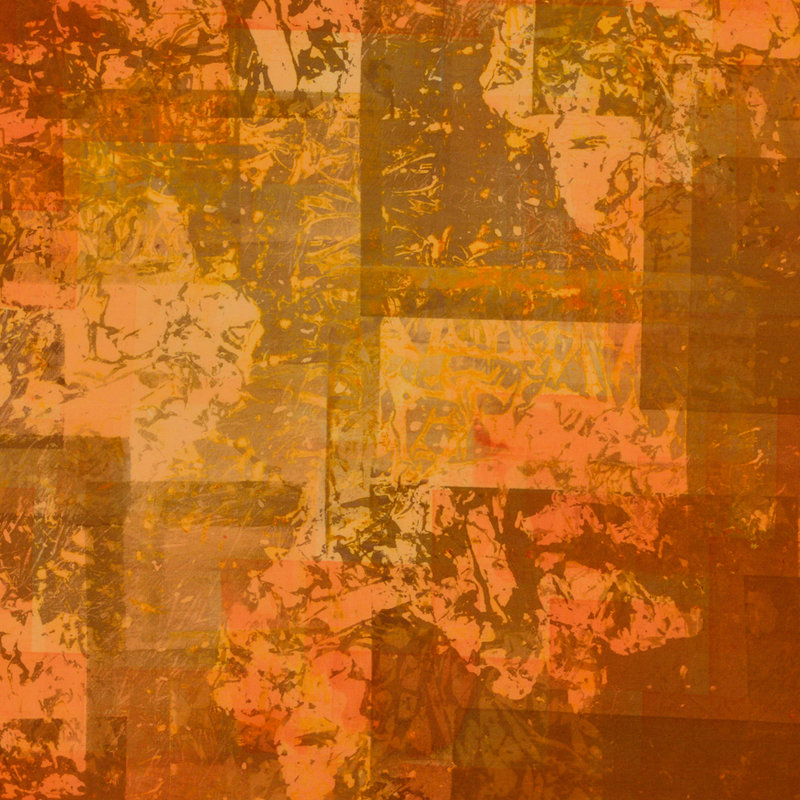 I am working on three connected bodies of abstract work taking their inspiration from industries that have touched my life, or have shaped my environment. There will be new work from my Traces series that looks at the coal mining industry and those iconic structures that have been erased (deconstruction) from our landscape. There will be new pieces from my Ruins series. This time I’m looking at Cotton mills in Manchester and how some have become homes to studio spaces, retail units and light industries. This is the reconstruction bit. And finally, a new series looking at evolution in the print and publishing industry as it adapts to change in demand and changes in technology. Sometime between now and then I will write / agonise over an artists statement that puts my ideas into good English but hopefully you get the idea. It is a big 6 metre x 9 metre corner gallery so I have two outside walls that I can hang work on. I’ve also asked for an internal wall about 4 metres long that divides the space. Taking into account entrances I have about 40 metres of wall to work with. I have finished pieces for about a third of the space. 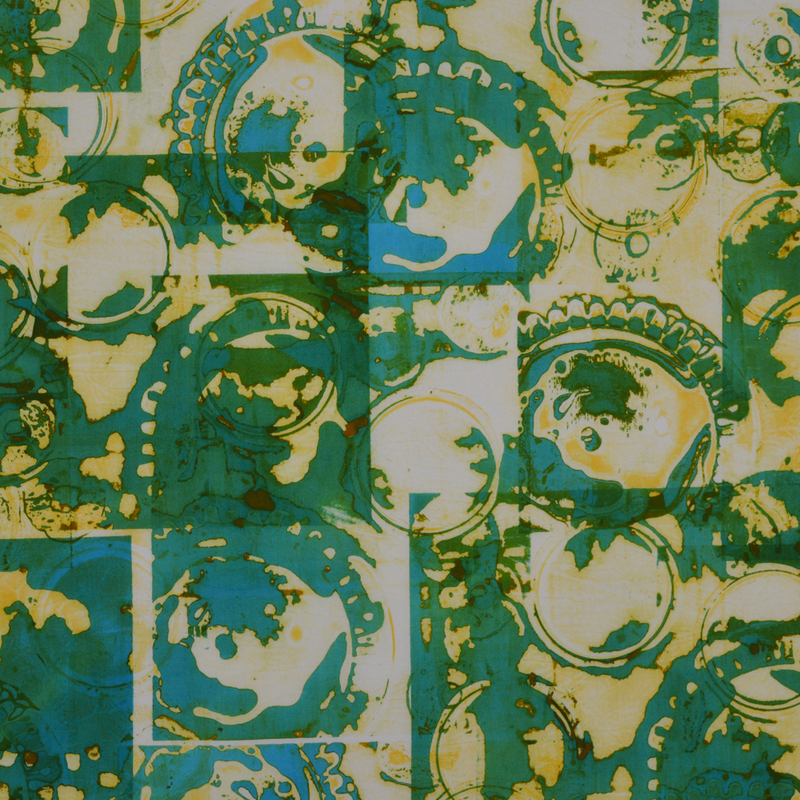 And I have two piles of printed and dyed fabrics ….. Yes, I am going to be busy! The other thing I got round to doing this week was a tidy up of my website. I’ve added a few new images. And I’ve removed the finished artworks from my shop although they are still for sale (contact me if you are interested). The number of sales / enquiries I get for finished work is tiny compared to those for my workshops so I decided to de-clutter the shop page. I think it looks much better! 2018 was an interesting year. Interesting is one word for it. Unexpected, eventful, scary, wonderful would all be other good words. But I think I will settle for life-changing. I’ve just read my post from 31st December 2017. I was pleased that I had spent more hours in the studio in 2017 than in 2016 and produced more work. I was busy working on pieces for the two exhibitions I had with Helen Conway in spring 2018. And I was planning to enter more calls for entry in 2018 and to find further exhibition opportunities. On the family front we were all still reeling from my mother-in-laws illness and passing but hoped for a quieter, healthier, less sad 2018. I was out of work but fully expecting to be back wearing my corporate hat within a few months. Life was on track. Turns out that life wanted me to take a different track. It proved difficult to find the right job and with an unexpected increase in my caring responsibilities at home I eventually realised that the life I thought I was going to have, balancing a demanding day job, caring for my family and making art was unsustainable and would probably make me miserable trying. I needed a Plan B. A plan that better fitted my family and that allowed me to continue to make art. 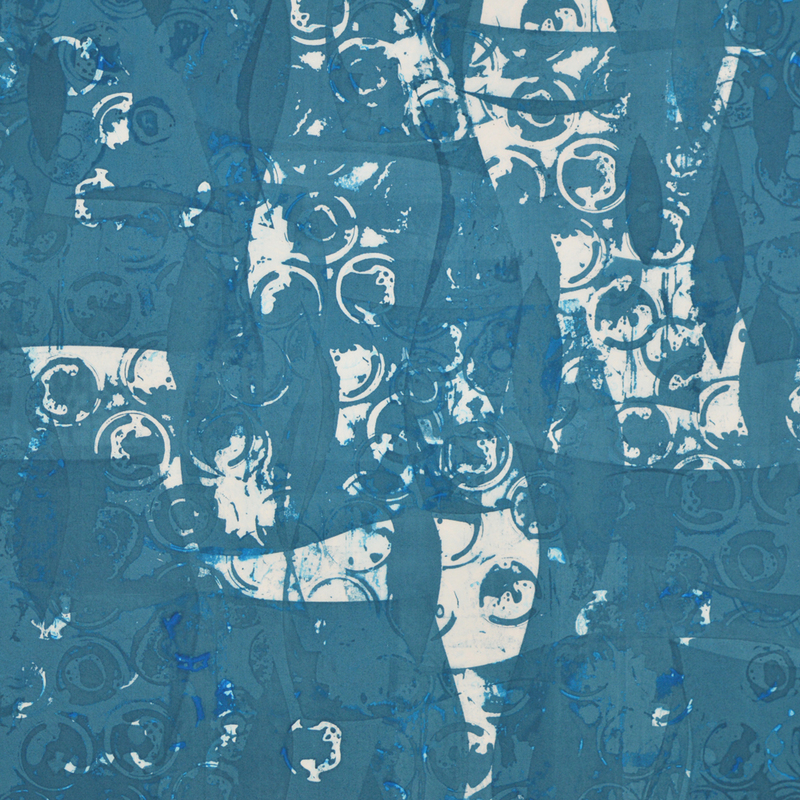 Teaching surface design was something I had planned to do a bit of in my sixties as I creaked towards retirement. I had given the occasional workshop to different textile groups and always loved it. And it was something I always intended to use my studio for. But would people want to learn from me? Could it pay the mortgage? So I did my research, crunched some numbers, talked with friends who were teachers and friends who might be potential students, talked with my family ….. and made a big decision. A seriously big decision to become a full time artist and teacher. And because I am ‘me’ I have given it my all. The studio has been named, Urban Studio North, reorganised and a rather splendid bathroom has been built. Courses have been developed and guest tutors booked. I’ve had stands at shows, demonstrated and given short workshops. And best of all I have taught some absolutely brilliant students and loved every minute of it! 2018 was a year of ‘firsts’. Full of change and full of new challenges. But there is so much more that I plan to do in 2019! So many more challenges to face, so many more ‘firsts’. …… Happy New Year! What a blast! Thank you! Festival of Quilts was amazing! A big thank you to everybody that came to visit my stand, it was wonderful to put so many faces to names and to catch up with so many friends. Hello to new subscribers to this blog and new friends on Facebook. Festival really is one big community and I am overwhelmed by all the support I've received for my new life as a full time artist and teacher. A special thank you to those of you who booked courses and brought fabric - I really didn't know what to expect at the show and was very nervous about making the investment but you have helped me believe that I am doing the right thing. And to Joe, Ruth and Gwyneth, my gang of helpers. I am a lucky lady. This is only a short post as I am just a little bit tired. I will post more about my two new 5 day retreats Breakdown Your Palette and Colour Your Palette, which I launched at Festival and which are now on my website, in the next few days but you might want to look now as there is only one place left on the Breakdown retreat in May! And I will post about my plans for the next 12 months - I am going to be busy, busy, busy! This time next week Festival of Quilts will be in full swing and the halls at the NEC, Birmingham will be buzzing with 1000's of quilters, embroiderers and textile enthusiasts. There will even be a handful of long suffering husbands and partners ... And I will, hopefully, have lots of visitors to my stand H35. My life plan didn't have me doing this until I was in my early 60's but life is never a straight line and so here I am and I couldn't be happier. I will turn 55 next Thursday and have already given myself the best present ever by deciding to become a full time artist and teacher. Deciding to take a stand at Festival at such short notice has meant that I've been working long, long hours in the studio. Being me I marked out my stand full size, decided what size tables would work and spent a really lovely few hours figuring out how to display my hand dyed fabrics. I folded fabric, I printed labels, I wrote and printed wash care slips, I ordered black fabric to use as table cloths, I brought some paper bags, I created a blog subscription sign up sheet and, one that I hope gets used lots, I made a workshop sign up sheet. I marked out the three walls of my stand on my design wall and went through my older quilts to see what might fit and look good. Most of my recent work is just too big but I did have a small Ruins piece that never got exhibited so, after fusing on 'urban studio north', this has become the centre piece of my display. I didn't have the right mix in my existing pieces so have had to make two quilts - Off The Grid which is a rather nice example of breakdown printing and Pass The Tequila which showcases a tray dyed piece of fabric. I've also made a funky little 'workshop' quilt. It has been a long time since I worked on anything that wasn't part of a series or destined for an exhibition and really enjoyed making them. It's been fun. I've also decided to develop a couple of 5 day retreats for 2019. The first one will be called 'Breakdown Your Palette' and will focus on breakdown printing and the benefits of using a limited selection of colours to create a cohesive collection of fabrics that can be used as whole cloth, pieced or used as yardage for clothing. The second will be called 'Colour Your Palette' and will focus on the addition and removal of colour through various dyeing and discharging methods. Again the emphasis will be on creating fabrics that work together. Both will be launched at Festival. Oh yes and I also heard last week that I will have a solo gallery at Festival 2019! Super excited! Going to be super busy! The Art gods have been shining on me - I am living my dream! When I decide to do something I really go for it, I give it my all and I aim to succeed. Determined, ambitious, tenacious - that's me. 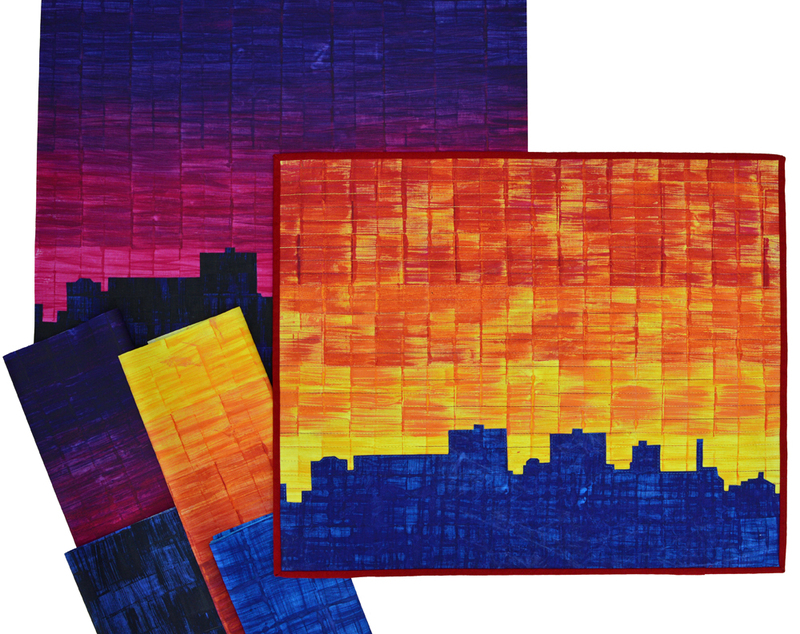 So I have taken a stand at this summers Festival of Quilts in order to promote Urban Studio North and my workshops to as wide an audience as possible. I will be on stand H35 which is in one of the alleys near the Nancy Crow exhibition. Please, please, please come find me if you are at the show! My stand is only small (2 metres x 2 metres) but I want it to showcase as many aspects of surface design as possible. After all that is what I teach. As well as showing a couple of my favourite small quilts I will be showing a couple of new pieces. These are 'process' driven - they do not have a specific inspiration but they each show how printed and dyed fabrics can be used. The first one is almost finished. 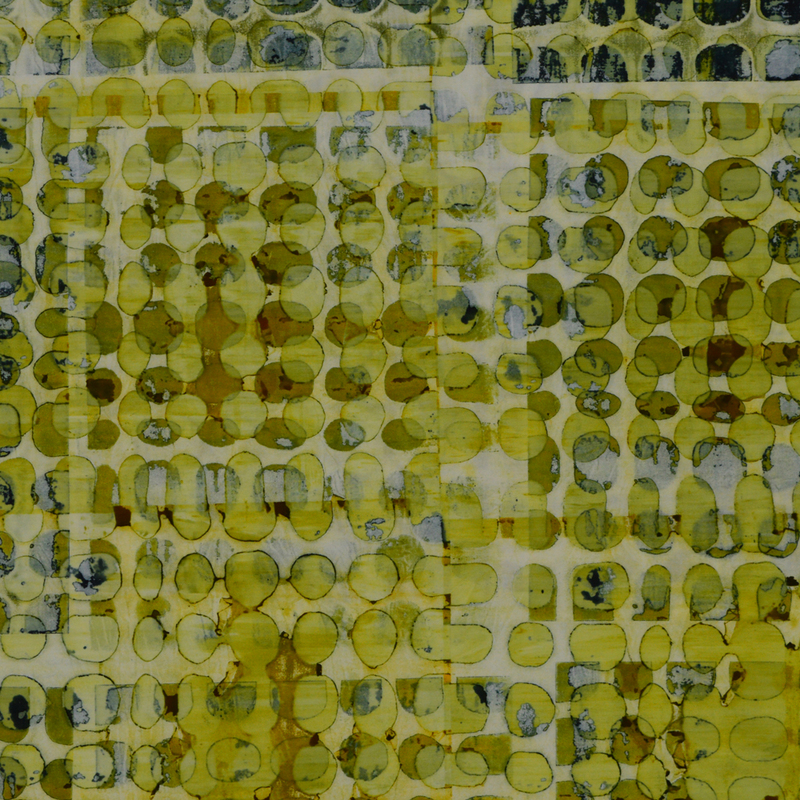 I'm calling it 'Off the Grid', detail below. The cloth went through 3 wet processes - I breakdown printed the first layer, then scraped through colour in the second layer and finally breakdown printed using formosol discharge paste. 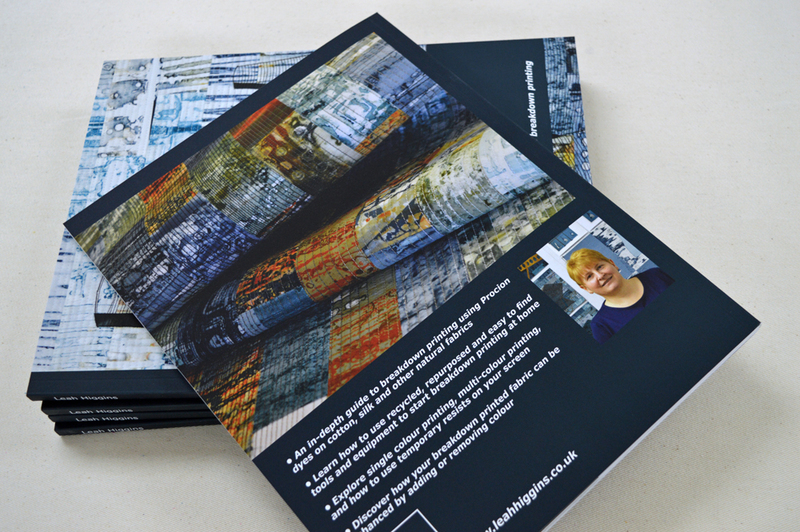 I will be supporting and encouraging students on my Introduction to Surface Design courses to take their cloth through multiple processes - you get such wonderful, totally unique, depth of colour and texture. I'm rather nervous about this new venture - it cost quite a bit of money and what if nobody signs up for a workshop! or even worse, what if nobody even stops to talk to me!! But I am also absolutely fizzing with excitement. I love talking about my work and my processes, and I especially love talking about colour. I am looking forward to seeing friends and making new friends. So if you are at Festival (9th to 12th August at the NEC, Birmingham), please stop by!